As I am what I would consider to be a 'modern feminist', I do worry myself sometimes when I suddenly get excited when I succeed in something Stepford wife-like. Last night I finally perfected a garlic sauce recipe after many previous sad attempts and found myself beaming with pride over it. Other Stepford wife epiphanies of mine include finding a shower cleaner that actually cleans grout properly, writing the grocery list in order of the aisles I walk down and baking cupcakes one lazy weekend afternoon. As a female generation Y-er, I have been brought up in the golden years after the previous generations fought for gender equality, basking in the freedom that I can to do whatever I like. I would consider the olden days of the unemployed, stay-at-home wife/mother and caretaker of the house and family to be old fashioned and outdated. It is tricker now as the boundaries of the male and female roles begin to blur. But there's no need for women to define themselves as the housekeeper anymore. This is not to say that the younger female generation can't enjoy cooking, cleaning or doing nice things for their partners. That is their choice, and choice is what the feminist revolution was about. However, I can't help but cringe when I catch myself in these stereotypical situations. 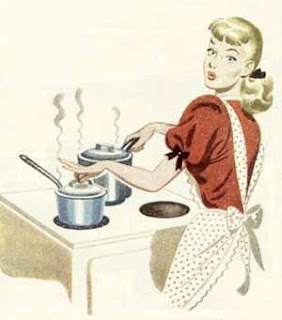 Luckily for me, when I'm in the kitchen I look nothing like a Stepford wife (see image above). No pearls, A-line dress, high heels or perfect hair. More like I'm in my fluffy robe, with bed socks and hair frizzing from the steam coming from the cooktop. 1. In a small non-stick pan on medium-high heat, saute garlic and butter. 2. When combined and aromatic, add in milk and cream and stir. 3. Stir occasionally as the mixture thickens (approx. 10 mins). 4. Add in parsley, shaved parmesan, salt and pepper to taste. You can also add sliced mushrooms as you stir to make a nice mushroom sauce. Kate, women are women and should be celebrated for all they can do. I for one can make a fabulous meal, am a great stay at home mom, but was equally as great in the business world when I lived there, I can shoot better than most men I know, and I explore my creative side through photography. Women are incredibly talented and versatile--like our grey dogs:) So no need to cringe when you find yourself not only mastering life outside the home but also life inside the home. It's just more proof of your awesomeness! Nice one Amy. Thanks for commenting! This post was just a light-hearted take on how I (clearly) over think everything. I do enjoy cooking despite it's stereotypes. And it can be tricky! But you may see the odd other recipe on here . . . .